The United States Federal Trade Commission today determined that Second Life's "Become Your Avatar" campaign was intentionally deceptive. Linden Lab is now required to use depictions of humans and their avatars in a manner that is consistent with typical users, rather than the five people they were able to find who are actually as attractive as their virtual counterparts. This ruling comes in the wake of the Manti Te'o imaginary girlfriend scandal. "If a college-educated man can be fooled by a falsetto voice on the telephone, how much more confusing would an encounter with a nubile young avatar be? "queried Myles Standish, FTC Special Agent in Charge. 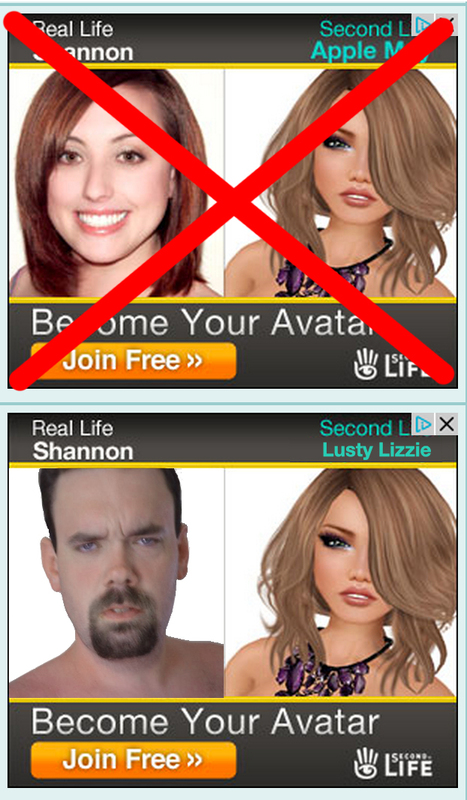 Linden Lab has not yet commented on the decision, but has already replaced their original ads with new versions that meet FTC standards. I wonder if that includes "Become Your Avatar" in general, or just specific ads. I see the BYA web page is still up. Perhaps they plan to appeal. I think Rob has some way to go . . .